I don't seem to be able to leave the crime books alone at the moment. For someone who, just four or five years ago, had hardly read any crime books at all - aside from an early 1990s addiction to Cadfael and a few Agatha Christies and Georges Simenons in my late teens - this is quite an amusing turn around. Of course my habit is being encouraged this year by two crime book challenges and this first book is for one of those, Bev's Vintage Crime Bingo challenge. I'm enjoying this one so much that I have a feeling I might end up reading for all 36 squares on the card! Anyway, Maigret in Holland is my 5th. book for this challenge and covers the category: A book set anywhere other than the USA or the UK. In this case the setting is Holland of course. A French professor who lectures on crime has got himself into a spot of bother in a village on the coast of Holland. A man was shot dead and the professor, who was staying in the dead man's house, discovered the gun and casually walked outside to the scene of the crime carrying it... thereby making himself a prime suspect. The powers that be ask Maigret to go and see what's happening although he has no jurisdiction there, naturally. The village is small and insular and everyone know everyone else's business. And there are secrets. The dead man is an ex-sailor who has married and settled down with an academic woman. It's clear the man had itchy feet and liked the company of women a bit too much. A local farmer's daughter is also clearly keeping a secret, as is a young merchant navy cadet. In fact there are too many secrets for Maigret's liking and the question is, how many people were a party to what was going on? Another brilliantly atmospheric Maigret case. I think Simenon was a clever writer all round but what he was especially clever at, to my mind, was creating atmospheric settings, often bleak areas or perhaps ordinary places in the depths of winter where locals are struggling to survive. 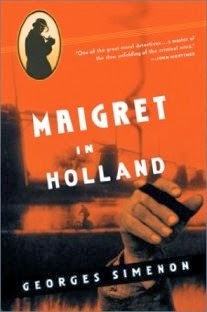 He created a sense of place wonderfully and here it's a Dutch coastal village surrounded by dykes, windswept and insular, which Maigret feels has the appearance of a toy village... too perfect by half... and such places, in his experience, have many secrets. And so it turns out to be. This was another case full of human frailty, frustration at domestic situations, and individuals trapped in one way or another. Things people have always struggled with and probably always will, so although this book was written in 1940 it still has a remarkably modern feel to it and still feels relevant. I think I could easily become addicted to Commissaire Maigret and his crime solving capabilities. And that's fine because there were around 75 books and 28 short stories apparently! Enough to satisfy even me, hopefully. Next up, A Moment of Silence by Miss Anna Dean. This book is for another challenge - My Kind of Mystery which is being hosted by Carolyn at Riedel Fascination. I'm also counting it for the Postal Challenge which is being hosted by The Indextrious Reader. 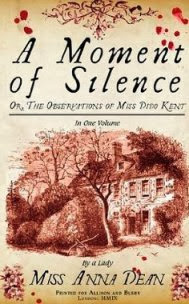 It's 1805 and Miss Dido Kent is the unmarried sister in a biggish family of siblings, a spinster aunt who is very fond of her nieces. One of them, Catherine, has just become engaged to a Mr. Richard Montague but something has happened to mar the girl's happiness. During the engagement party a strange man appeared, said nothing to Richard, but somehow a message was conveyed, and he has now disappeared under some kind of disgrace and called off the engagement. Catherine has no idea what has happened and begs her aunt to come to Belsfield Hall to try to solve the mystery. No sooner has Dido arrived than the body of a woman is found in the shrubbery. No one has any clue who she is but Dido soon discovers that the woman was pregnant. Are the two events connected? Richard's family are a motley crowd and there are various other houseguests as well. Was the woman killed by some stranger or is there a murderer in the house? Dido's investigations into the murder and Richard's disappearance will eventually uncover some very odd secrets indeed. 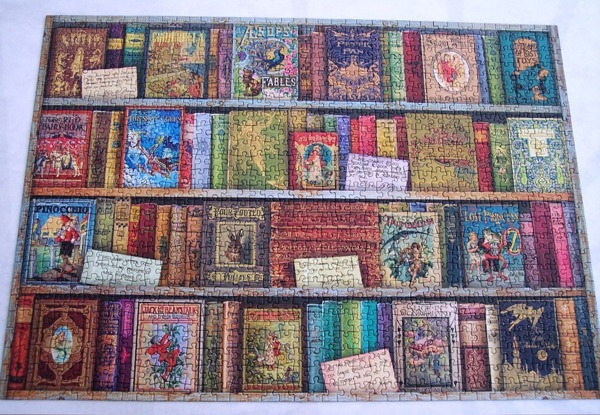 It been a busy week - half-term school holidays with my lovely grandchildren featuring quite heavily - so not much reading has been done. What I have managed to do is finish several books that I've been reading for a while, so I thought I'd do quick reviews of those to bring myself up to date. First up, The Mad Hatter Mystery by American author, John Dickson Carr. This qualifies for 'A Book by an Author You've Never Read' in the Vintage Mystery Bingo Challenge which is being hosted by Bev at My Reader's Block. It seems a madman is loose in 1930s London, stealing hats and leaving them in odd places. Sir William Bitton has just had a second hat pinched but more seriously he's also had a manuscript stolen. It's purported to be the first written story by Edgar Allan Poe, and the way that Bitton came by it was borderline legal. He goes to the police and they call in an amateur detective Dr. Gideon Fell. He hasn't even had time to study the facts properly before a murder occurs. The dead man is Bitton's nephew, a free-lance reporter, and he's been killed with a cross-bow bolt - used as a knife not fired - in The Tower of London. There are many suspects, the dead man had his finger in many pies and was also having an adulterous affair. But is there a connection with Bitton's lost manuscript and the hat thief? It's very confusing and timing and tracing people's movements is crucial. Dr. Fell and his associates have their work cut out. This is the second book in John Dickson Carr's 'Dr. Gideon Fell' series, written from the early 1930s to the late 1960s. I may have benefitted by reading the first book, The Hag's Nook, first, to be honest, as then I might have known a little more about Fell and his American associate, Rampole (I kept wanting to call him 'Rumpole')... how they met and so on. Possibly I may have felt a bit more of a connection to Fell if I had. As it was I enjoyed the mystery element quite a bit, there were lots of twists and turns and discoveries of the secrets people were keeping. The details of the Tower of London were interesting, nice to be reminded of my one and only visit there about 15 years ago. Really this was, to me, a servicable mystery story, fun, of its time, but I wasn't crazy about the amateur detective in it, Gideon Fell. I now own The Hag's Nook now so will read that in due course, probably for R.I.P. later in the year as it's a bit spooky by the look of it. Hopefully I might like that a bit more. I didn't 'dislike' this book at all, I just didn't love it in the way I'm loving Dorothy L. Sayers for instance. 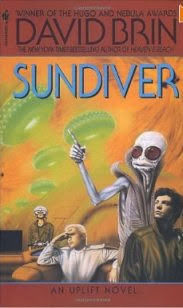 Next, Sundiver by David Brin. This book is set in a future where man has reached the stars 'but' he's an oddity amongst other alien races. It seems other sentient, intelligent races have all been 'uplifted' or mentored by more advanced races. Humans have reached sentience under their own steam and are thus looked upon with a great deal of suspicion. Now though, a race of beings has been discovered living within the depths of our sun. Jacob Demwa, a scientist who works with Dolphins, teaching them to speak, is asked by an alien friend to go to Mercury and do a dive into the sun with a group of sundry scientists and aliens. The suggestion is that the aliens in the sun may have been the race who uplifted humans millenia ago, but for some reason abandoned us. Jacob expects the mission to be amazing and dangerous but he doesn't expect murder and intrigue to take over the entire project. I gave this book a three star rating on GoodReads which is possibly a bit mean, really it was another three and a half. There were elements of it that I really liked. The concept of 'uplifting' by mentors I found interesting and the aliens introduced were intriguing and very well described. I liked the idea that humans themselves were uplifting dolphins and chimpanzees and that this gained them some acceptance in the eyes of the powers that be in the galaxy. The mystery element was quite strong - this is in effect a science fiction crime story - and that side of it held up quite well. Where it fell down for me was in the human characters. I felt very little empathy for Jacob, didn't care for him much at all. Another scientist who supposedly led the project felt really badly written to me when he should have been a strong, able character. All this detracted from what should have been a stonking good read and it's a shame. I will however continue with the series, partly because I went to the trouble of bringing several of them back from the US last time we were there, but also I do like the universe the author has created and would like to read more. Mollie Panter-Downes was a British journalist who wrote primarily for The New Yorker magazine from the 1930s right through to the 1960s. She's best known for two volumes of short stories published by Persephone, this and Minnie's Room, both dealing with World War 2. Minnie's Room dealt with events just before the war, whereas Good Evening, Mrs. Craven deals with events on the home front in Britain 'during' the war. The stories deal with just about everything to do with how the middle-classes coped with things such as evacuation, loss of servants, husbands being sent off to war, women who had affairs, groups knitting comforts for the troops, friends landing on people to stay indefinitely. Each little story, and none are very long, is just perfect in what it says about its given situation. 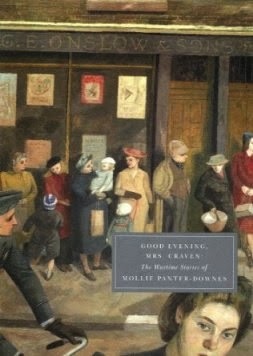 Mollie Panter-Downes was an absolutely brilliant observer of people. She clearly understood the dilemmas real people experienced because of a war no one wanted but had foisted upon them anyway. She understood that people who behaved shabbily weren't necessarily bad people, just ordinary folk trying their best in difficult circumstances. 'Poignant' is a good description for the stories in this book, I felt so sad for just about everyone, though there was some humour to be gleaned from the several stories about the vagaries of the knitting group. I honestly think these two anthologies are some of the best short stories I've read and would recommend them both to anyone interested in the home-front in World War 2. Sundiver and Good Evening, Mrs. Craven are both reads for the Mount TBR challenge which is being hosted by Bev at My Reader's Block. Some books are easier to review than others aren't they? I haven't the first idea how to start with this next one. 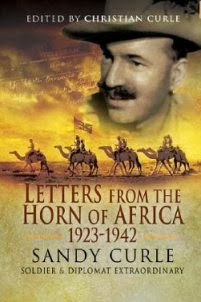 It's Letters from the Horn of Africa - 1923 - 1942 by Sandy Curle and edited by his daughter, Christian Curle. It's my first book for the Postal Reading Challenge 2014 which is being hosted by The Indextrious Reader and, as Sandy Curle was Scottish, my second book for the Read Scotland Challenge 2014 which is being hosted by Peggy at Peggy Ann's Post. (She has created a really nice group for this challenge on GoodReads.) I think that's it... it doesn't qualify for the Mount TBR challenge as the book is a library book. Ok, well Sandy Curle (I think his real name was Alexander but it was only mentioned once or twice and I may be wrong) was born in Edinburgh in 1900. He came from a family of lawyers, obviously not badly off as he was educated privately. Apparently he didn't enjoy school, but was clearly a born soldier as he thrived at Sandhurst (the UK's college for army officers) and came out of there a Second Lieutenant in the Gordon Highlanders. It was 1918 and the end of WW1 and Sandy's first post was to the Rhineland to help clear up after the war. As soon as he could though he got out of there and got himself seconded to The King's African Rifles (K.A.R.) and, aged twenty three, was sent to Jubaland, a disputed area on the border between Kenya (at the time part of the British Empire) and Italian Somaliland, now Somalia of course. The Italians were given Jubaland after WW1 as a reward for siding with the allies in the war and Sandy was part of the force presiding over the hand-over. From there he proceeded to be moved all over the Horn of Africa. In 1929 he retired from the army and joined the Colonial Service as an Admin. Officer in British Somaliland. His main concern was the ambitions of the Italians, led by Mussolini of course, who it was known had designs on Ethiopia and indeed one of the main events of his career was dealing with the repercussions of that invasion in 1935. In fact there are those who believe that WW2 began with that invasion and not in Europe. Sandy decided he needed a break from warfare and in 1937 got himself transferred to Tanganyika as a District Officer. Here he was able to lead a more normal life for a while but it wasn't to last and when war broke out again he was back in the KAR reserves as a captain. His main acheivement was the creation of the Ethiopian Irregulars, almost a guerilla band, who led the reoccupation of Ethiopia in 1941. The letters end there. Sandy finished the war in Kenya. 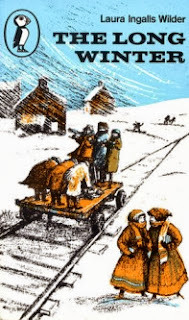 He had a wife in Scotland and a daughter aged, five, that he had never seen as he had sent his wife back to Scotland, pregnant, when things started to get bad in East Africa. What a fascinating book this was. I won't say it didn't drag a bit in places because it did. Sandy was writing primarily to his father and the correspondence was a bit formal with quite a bit of detail about the army and his job. Despite that the man's personality shines through and he was clearly an old-school colonial officer who took his job and his responsibilites very seriously. I was reminded of my father-in-law quite a lot and he too was in Africa before the war funnily enough - Rhodesia I gather. The main interest for me was the firsthand account of important historical events. I won't say I was ignorant of them because that's not quite true. I knew of the Italian involvement in the Horn of Africa before the war but not that they, the French, and us the British, had Somalia and Eritrea all carved up between them with independent Ethiopia having such a struggle to hang on to their independance. This way of learning such pertinant facts via someone's personal correspondence, someone who was on the spot and reporting back on a weekly or monthly basis, works extremely well. I now feel much better informed though how much of it I'll retain I'm not sure. Hopefully a fair bit. As always with a book like this you learn that things were not always as black and white as more formal history books would have us believe and for me that's my main reason in reading this kind of book. Not a book you might call 'enjoyable' but certainly very interesting and informative and I'm very glad to have read it. Goodness this is my 500th post for this book blog! What a journey it's been and by and large I feel very glad that I took the plunge and started blogging here six years ago. I've met some delightful people who I now consider to be firm friends. Sadly, since I started, some whom I met back then no longer blog and I always feel the loss when they give up. Luckily, many are still here and blogging about books is still something I love and would not give up for anything. All that said, I've turned off anonymous comments for this blog. It's only the spammers that seem to use it and they're getting be a real nuisance once again. If it turns out to have some kind of consequence I hadn't considered then I'll turn it on again but in the meantime it's off I'm afraid. Anyway, for this post I'm doing two shorter reviews of vintage crime books. 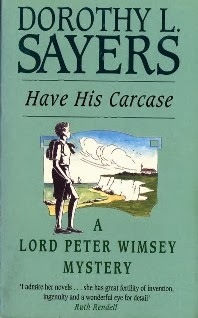 First up, Have His Carcase by Dorothy L. Sayers. This is my second book for the Vintage Crime Challenge which is being hosted by Bev at My Reader's Block and covers the category for 'A book set in England'. It's also my 5th. book for Bev's Mount TBR challenge. After the events of Strong Poison, where Harriet Vane was tried for murder, and following the success of her new crime book, Harriet Vane is in need of a holiday. She chooses a walking holiday on the South West coast of England. Stopping on a beautiful beach for a picnic lunch and a nap she wakes to discover a body just around the headland. The body is wedged into a large rock called The Flat-iron and it's fresh, clearly a very recent suicide or murder. The police are inclined to think 'suicide' but Lord Peter Wimsey turns up the next day and confirms Harriet's suspicions that all is not as it should be. The dead man is a young dancer from a local hotel, but of Russian extraction. He's engaged to a much older woman who feels the Bolsheviks must be involved. But the case turns out to be much more complicated than that. Several male suspects are involved and one of the most crucial things is 'timing'. If the dancer was murdered who had a cast-iron alibi? All of them it turns out. This is the most complicated case Lord Peter Wimsey has come across and it takes the combined efforts of himself, Harriet, and the local police to bring it to a satisfactory conclusion. I think I can honestly say, without a shadow of a doubt, that this is one of the best crime books I've ever read. It's long, 444 pages, and that's quite lengthy for a crime yarn, especially a vintage one as far as I know. But it just didn't seem that long while I was reading, it fair galloped along plot-wise, a real page-turner. I loved how complicated it was. I didn't always follow the cipher stuff towards the end but that's OK, I like to be mentally stretched and it told me a lot about such things which is always good. It was also hugely funny. The dialogue is very witty and really just a joy... huge fun to read what is quite a serious crime book but to find it doesn't take itself *too* seriously. I felt Dorothy Sayers knew the SW coast rather well. The atmosphere of a sleepy coastal village in that area - I'm guessing Devon but am not positive - was spot on as were the accents and attitudes of the locals ie: being suspicious of strangers. 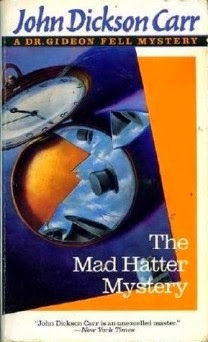 Most of all what I loved about this book was the two main characters, Lord Peter Wimsey and Harriet Vane. Their relationship is a joy and the constant proposals of marriage from Wimsey, hilarious. All in all this was just such a brilliant read. I wouldn't be at all surprised if it doesn't make my top ten at the end of the year. A body is found in a stable attached to an eating place on the towpath of a canal near Dizy in France. It's under the hay and two men have slept beside it, not knowing it was there. Maigret arrives to investigate and finds the case to be very difficult to understand. It seems impossible that anyone could physically commit the murder as the towpath is difficult to get onto from the road and shifting the body would have been nigh on impossible. The dead woman is the wife of an English ex-army colonel. She's been living aboard a yacht with her husband and sundry other unsavoury looking people. None of them seem to care much about the dead woman and when Maigret gets wind of promiscuous goings on amongst the inhabitants of the boat he realises he needs to know a lot more about who this woman actually is. It's extremely complicated and Maigret is hard put to decide whether the key to the woman's murder is to be found aboard the yacht or among the bargees, carters and lock-keepers who use this canal. I seem to be on a bit of a Maigret kick at the moment. These vintage crime stories are little gems and ideal fodder for the Vintage Crime challenge. This one covers the category - 'A mystery that involves water'. Anyway, this was a very enjoyable crime yarn. Beautiful atmosphere of the canal, the people who live and work on it and the conditions they worked under in France in the 1930s. The mystery was as complicated as the previous Maigret book I read, The Yellow Dog, with lots of unknown information which the reader is slowly drip-fed. 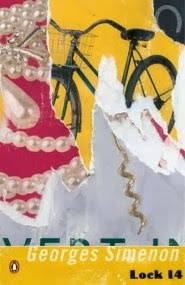 I loved the image of Maigret on his bike pedalling away for forty miles to try and catch up with a barge. I don't know why I was so amused by that but I was. One thing you do need to remember about these books (both of the ones reviewed here in fact) is that they are set in the 1930s and as such, times were different and much less pc than we are today. Thus people get called names that we wouldn't perhaps consider acceptable now. It worries some people I know, but for me it's written history and although I might blanch a bit it's not a problem. I would never want the books updated to be more pc in any way shape or form. I have to say that I'm thoroughly enjoying the reading challenges I'm doing this year and if I continue the way I've begun am hoping to end the year having done quite well with them. Fingers crossed. Sadly, Carl's Science-Fiction Experience has once again come to an end. The two months absolutely whizzed by, probably because I have enjoyed it so much... time flies when you're having fun. So, five books read in all. 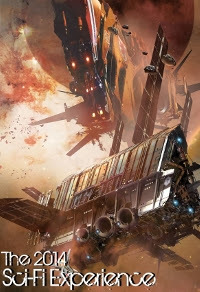 A mixed bag, one very classic read in Helliconia Spring, a new space opera series started in the two Miles Vorkosigan books, a book by Octavia Butler at long last and a complicated, very interesting read in Consider Phlebas by Iain M. Banks. I would call that a successful Sci-fi Experience this time around and I'm very pleased with the way it went. The other thing that pleases me is that all five books were owned by me, so that's five books off the tbr mountain! Hard to choose a favourite as they were all rather good. But the book that edges ever so slightly ahead is Helliconia Spring as it was just so darn good. I meant to read its sequel, Helliconia Summer, for the Experience too but have not managed it. No matter, I plan to carry on reading science-fiction this year and am hoping to get to that book later this month. Many thanks to Carl for once again hosting his Science-Fiction Experience, it really is very much appreciated. 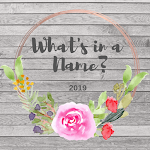 One of the reading challenges I signed up for this year started yesterday and it's The My Kind of Mystery challenge which is being hosted by Carolyn at Riedel Fascination. It's one I'm particularly keen to participate in as I've chosen books that are not necessarily centred around the crime of murder but which are more about other types of crime or some kind of adventure. There may be a murder involved but it's not the centre of the action so to speak. Of course, this challenge is called 'MY' Kind of Mystery so it's really up to the person particpating what they choose to do, this is my way of separating it from The Vintage Crime challenge that I'm also doing this year. Anyway I'm looking forward greatly to doing this one, I met Carolyn on GoodReads as a matter of fact - it's amazing how many friendly and interesting people seem to hang out there. I can't recommend the place highly enough. Huge fun. 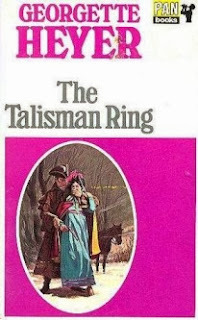 Anyway, my first book for this new challenge is The Talisman Ring by Georgette Heyer. I might also add that it qualifies as book four of my Mount TBR challenge being hosted by Bev at My Reader's Block. Eustacie is eighteen years old and a refugee from civil-war torn France. Her grandfather, Lord Sylvester Lavenham, rescued her when it became obvious that the French were sending all their aristocracy to the guillotine. Now Sylvester is dying and to assure his grand-daughter's future he's asked Lord Tristram Shield, his great-nephew but not his heir, to marry the girl. Tristram is thirty one, realises he needs a wife to continue his line and as he hasn't any better ideas, accepts his great-uncle's plan. Eustacie, being French and rather romantic, is not quite as enamoured of the idea, Trisram being her idea of a man who is not at all romantic. I can't think why I haven't read this book before. It may partly be because I've always adored Georgette Heyer's straightforward Regency romances and because this was a 'Georgian' romance mixed with a mystery I wasn't keen. I don't know. Whatever the reason this one has sat on my shelves for years unread. I'm tempted to say, 'What a criminal shame' and perhaps it is... but on the other hand sometimes a book is just perfect for a particular challenge or some other reason and the feeling is that you're actually quite glad you've not read it before because it has turned out to be just perfect for 'now'. I always forget how much I love Georgette Heyer's writing. It is simply sublime and The Talisman Ring is a perfect example of her skill. Most of the action actually takes place in an inn and you might think that restrictive but not a bit of it. It's actually an intimate setting and we get to know the characters who are staying there very well indeed. From exitable and romantic Eustacie who has taken up Ludovic's cause, to Ludovic himself, to Sarah Thane and her affectionate brother, Sir Hugo, only interested in brandy and good food. All are beautifully written and all get embroiled in Eustacie's plans to clear her cousin's name. Lord Tristram is a reluctant accomplice at first but even he thaws under the influence of the the two women, Eustacie and Sarah, and his mad cousin, Ludovic. It all sounds like a Georgian romp and that's indeed what it is. There's intrigue, night-time burglaries, smugglers, a mystery to be solved and goodness knows what else, all written tongue-in-cheek with a huge dollop of humour. Every character is beautifully written but my favourite by far is Sarah Thane who is brave, sensible, very astute and knows exactly how to handle Eustacie, her own one-track-minded brother, Hugh, and of course, Lord Tristram Shield. The mystery itself, though seemingly complicated, is not that difficult to fathom and the culprit is fairly obvious. That did not matter a jot. The joy of this book is in the journey and as such I absolutely 'loved' it. From being an obscure book of Heyer's that I knew nothing about it's now one of my absolute favourites and definitely a contender for a regular reread like Sylvester and Frederica. 3. Space Plague - Zac Harrison. Book six in the 'Hyperspace High' series. I've been reading this six part (so far) series at my grand-daughter's (and her mum and dad's) recommendation. They're fun, undemanding reads about an Earth boy who mistakenly gets picked up to go to a new school and ends up in space in a space-ship high-school with kids from thousands of planets. This is science fiction for younger readers and anyone young at heart who wants a quick sci-fi read. Great too, I would think, for boys who're reluctant readers. I've enjoyed them all. 9. Tentacles - Roland Smith. Another series I've been reading with my eldest daughter's family. Twins at a private school find out their explorer parents have gone missing in Brazil and that they have to go and live with an uncle they didn't know they had, on an island. Turns out he's a scientist who searches for crytids - animals that have never been proved to exist or have gone extinct. In the first book, Jungle Hunters, they go searching for dinosaur eggs and in book two they're after a kraken - a giant squid. There are loads of complications and twists with family and so forth, and all in all these books are rather entertaining. 10. The Talisman Ring - Georgette Heyer. To be reviewed. My plan this year is to try and read more books from own bookshelves. So how has that panned out this month? Well... of these ten, five were library books, one belongs to my grand-daughter and four were my own. Hmm. I'm doing Bev's Mount TBR challenge this year and have signed up for forty eight books. Which means reading four of my own books each month. So I'm on course for that, no problem, *but* part of me wants to do a bit better than that so I need to concentrate a bit harder and apply myself. Everyone seems to be suffering with the weather at the moment... snow and freezing temps in North America, rain and floods over here etc. I hope everyone is safe and dry and warm and has lots of good books to read.